This is a bird of two habitats, the upland moorlands and the estuarine edge, and Short-eared Owls may be found prospecting for breeding sites around the highest and the lowest points of the county, but nowhere in between. They probably bred in the Frodsham Marsh area for two or three years in the mid-1970s, with a nest found in 1975, and ‘a pair is reported to have bred in the county’ according to the 1989 annual bird report, but with no detail. Odd sightings of single birds in the breeding season were recorded on the eastern moors in 1990 to 1993, 1996, 1998 and from 2003 onwards. 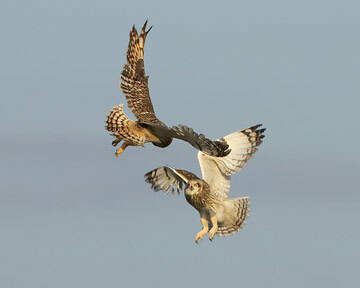 During this Atlas period, pairs were seen in two of the moorland tetrads, with breeding proven in one of them. Surveys of the South Pennines Moors SPA showed a 50% increase between 1990 and 2004-05 in the breeding population of Short-eared Owls, and it seems that the Cheshire moorland fringe has shared in this rise in their fortunes (Eaton et al 2007). Short-eared Owls nest in open country, in moorland, marsh land and bogs, and in young conifer plantations; in recent years they have also been seen prospecting in set-aside fields, and have been known to breed in them elsewhere in England. The adults hunt by day, especially in the afternoons, and at night, quartering the ground with their long winged flight. In the breeding season, they depend especially on Field Voles which comprise more than 80% of their food items, with the remainder being mice, shrews and birds. Much of their lives is determined by the abundance of Field Voles, which varies on a cycle of three or four years. Short-eared Owls can have a protracted breeding season, some birds laying eggs in March while others linger late in wintering areas, even until mid-May in some years. This is the only Palearctic owl that builds a nest, making a scrape lined with dead grasses. They can lay 4 to 9 eggs or more, with most in ‘vole years’, but clutch size varies with latitude, decreasing at more southerly sites, and figures from Cheshire are unknown. Their ground nests are vulnerable to predation, especially by foxes and crows, and chicks scatter from the nest 12-17 days after hatching to hide in the undergrowth, but cannot fly until 25 days or older.